Racquety Farm is a Soil Association certificated organic farm comprised of arable, pasture, orchards and woodland. The farm is on the banks of the River Wye (SSSI), site of speical scientific interest. We have riperian rights see fishing for details. Our farm is supporting a community allotment project, which also has produce for sale, and can offer advice and learning opportunities for novice growers interested in biodynamics. See Hayfield Garden. We can grow organic crops on contract or provide top quality forage via a grazing license. Fun and frolics at the farm! 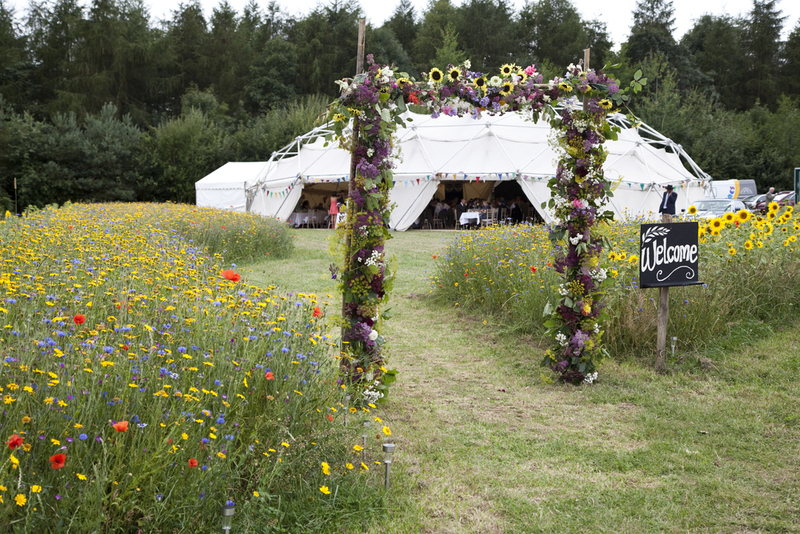 Why not consider the farm for your event, for example we can cater for occasional markets and fairs, weddings, parties, group activities or camps, the possibilities are endless! Make a statement at your event with a Geodesic Marquee. All this is within walking distance of Hay-on-Wye and Clyro. Close to our main site are national Cycle Paths, Offas Dyke Path, The Wye Valley Walk, The Brecon Beacons National Park and Black Mountains.